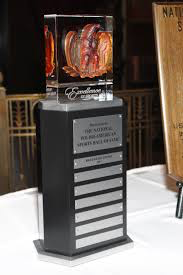 In conjunction with its 40thAnniversary celebration in 2013, the National Polish-American Sports Hall of Fame announced the creation of its new Excellence in Sports award, which has since been presented annually to a Polish-American athlete or sports personality for achieving the highest level of accomplishment in their field. In 1989, the National Polish-American Sports Hall of Fame established its Special Recognition Award, as a means of recognizing those individuals that have demonstrated dedication, devotion and service to sports, in extraordinary but frequently unheralded ways. In 2010, by vote of the Board of Directors, the award was re-named in honor of former Detroit Pistons’ Public Relations Director Matt Dobek. The award is presented annually at the NPASHF Induction Banquet. 2018 — Joe Drobot, Jr.